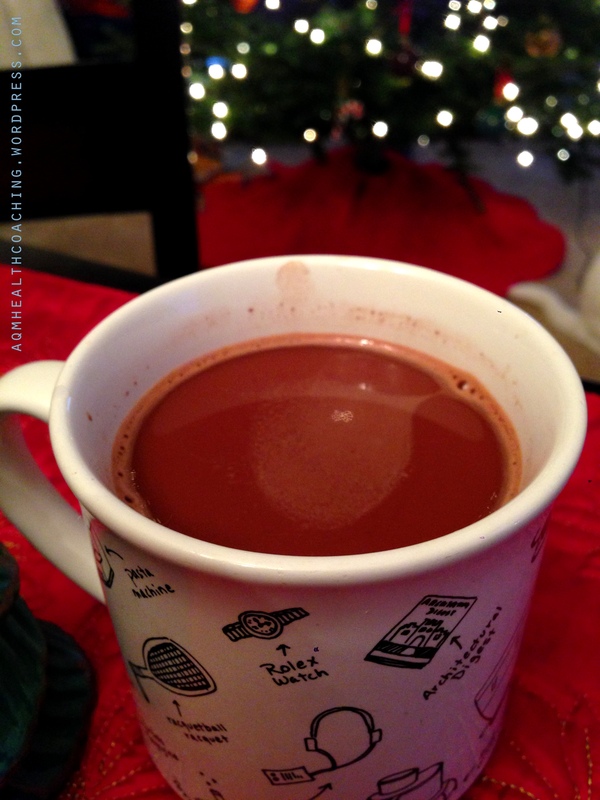 Your tip for the 20th day of 31 Days of Healthy Ways to Enjoy the Holidays More is to make yourself a cup of hot chocolate. Chocolate has many health benefits, including lowering blood pressure, reduces insulin resistance and can even lower your stress levels. No wonder so many of us reach for the stuff when we’re overwhelmed and anxious! It’s full of antioxidants, flavonoids and minerals like magnesium and iron. In order to get some health benefits from this delicious stuff, the key is the quality you choose. Eating milk chocolate covered marshmallows isn’t going to do you any good. There’s just not enough cocoa in it. For snacking, look for organic dark chocolate, 70% cacao or higher. And when choosing cocoa powder, look for non-alkalized (not Dutch) cocoa powders, preferably organic. If you can find raw organic cacao powder, even better! It tastes the same as cocoa but the processing is slightly different leaving it with higher antioxidant content (supposedly). Mix cocoa, honey and salt in a small sauce pan. Stir in 1 tbsp warm water and bring to just boiling, stirring with a wooden spoon occasionally. Once it boils, pour in your almond milk (or other milk) and vanilla (if using) and heat just until hot, again, stirring occasionally to make sure all the cocoa gets mixed in. Serve and enjoy. If you want a hot cocoa with a little more protein and pizzaz (and you have a great blender), check out this awesome recipe by Modern Vintage Cooking. I make it with peppermint tea, one less date and a little extra cocoa. It makes for a filling and delicious chocolatey snack. I like it hot, John likes it cold. Oh, and if you put it in the freezer for 45 minutes, you’ll have an awesome puddinglike concoction to eat with a spoon. YUM! Cozy up today with a warm cup of hot chocolate! This entry was posted in Dairy Free, Gluten Free, Healthy Tips, Recipes and tagged 31 Days, Chocolate, Drinks, Healthy Holiday Tips on December 20, 2013 by Andrea Quigley Maynard.